Dermal fillers are very versatile products with many indications available for this treatment. 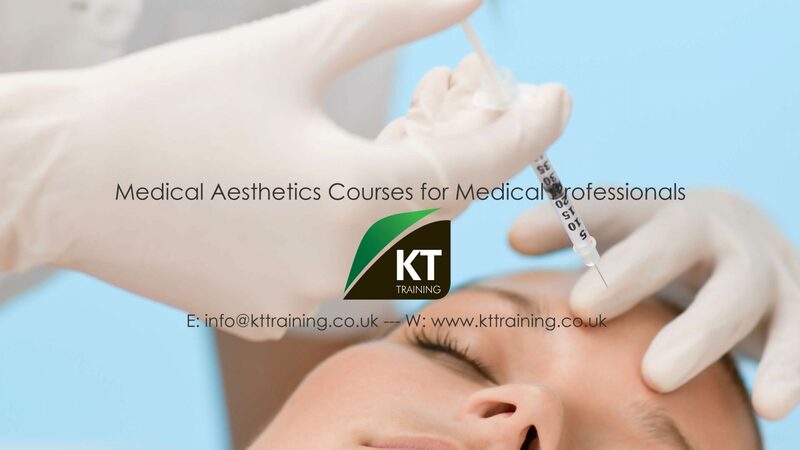 Therefore KT Training provide a number of dermal filler training courses. Each course requires specific treatments. This course only provides treatments with HA dermal fillers for the following indications. The advanced course includes treatments to augment the mid face and lift the corners of the eyebrow with filler. The lip master class is focused on lip treatment and the up turn of the corners of the mouth. We only use the best dermal filler products available for the treatments on the courses. The Juvederm Ultra and Teosyal products are the main products used. We will also use Belotero depending on the indications and courses. Dermal fillers are used to soften and contour lines, folds, and wrinkles. The most commonly used dermal fillers are Collagen based or Hyaluronic based. The solution is injected into the skin to add volume and create a more youthful appearance. Are There Many Different Types of Dermal Fillers? Various dermal fillers can be used to immediately soften fine lines, wrinkles and skin folds. These fillers can also be used to mould and contour the preparations of these fillers can also be used to enhance lip volume and to improve the mouth shape. The most commonly used fillers are cross-linked hyaluronic acid gel preparations specifically manufactured and designed for this purpose. These hyaluronic acid fillers are not permanent, will be slowly absorbed and will last 6-9 months before needing a repeat procedure. How much do the dermal filler treatments usually cost? Treatments are usually charged per syringe the cost for dermal fillers can vary in each clinic approximately £250 to £300 depending on products used. Are dermal filler treatment painful? There is some discomfort. The product is injected into the skin with a very fine needle and patients are treated with a topical aesthetic. Juvederm Ultra already contains lignocaine which assists with pain management. Can I have dermal fillers treatment and go back to work? Yes. Some patients may experience some redness, swelling or bruising which can be minimized with cover-up makeup. Non permanent dermal fillers have demonstrated consistent safety for over 20 years. The non-permanent dermal fillers used on the training course include Teosyal, Belotero, Restylane and Juvederm Ultra. There are always some risks that is involve whenever a patients is exposed to any foreign product but the risks associated with the selected group of dermal fillers that we have discussed are minimal. The Dermal Fillers used for treatments are non-animal hyaluronic acid and designed to fill facial lines for facial contouring and lip augmentation. The possible side effects may include redness, swelling, bleeding, bruising, pain, itching, infection, discoloration, hypersensitivity. You should be aware of contra indications-post allergic reaction or hypersensitivity to the product. Please note if you have a history of anaphylaxis shock or had a previous complications with any dermal filler products you will not be suitable as a model for our training courses. Soon after treatment there may be slight redness, swelling, some tenderness, and itching at the site of the treated areas. This is a normal effect of the injection; it is only temporary and as a rule will disappear in one or two days. When the lips are injected the initial swelling may last longer. Some patients can experience swelling for up to one/two week and the area can look uneven during that time. The immediate look of after the treatment is not the final result. After 2 weeks when all the swelling has resided the final results will be visible. Avoid touching the treated areas for at least six hours. After six hours have passed, the areas can be washed gently with soap and water and light make-up can be applied. If the area is tender, apply some ice to the treatment site. Do not engage in strenuous exercise right after the treatment. If possible, avoid the sun, as sun exposure will reduce the persistence of the product. Do not enter sauna’s or environments of extreme heat for at least two weeks following the treatment. Massage the treatment site if you experience lumpiness. Do not apply any creams which contain alpha hydroxy acids. Avoid the sun and wear a sun screen at all times. Patients who have had cold sores in the past should note that there is always a risk that injecting any product around the lips may cause the herpes to flare up again. Patients taking aspirin, large amounts of vitamin C, anti-coagulants, or any other similar medications should be aware that this could increase bleeding and bruising at the sites of injection. Arnica gel can be used to reduce bruising and a good concealer can be used to cover any dark spots. If you experience excessive swelling or infection contact us immediately.